I read this article and found it very interesting, thought it might be something for you. 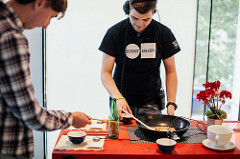 The article is called Review: Soundcheck at The Science Gallery and is located at https://www.totallydublin.ie/event/review-soundcheck-science-gallery/. When I walk into the Soundcheck exhibition at Trinity’s Science Gallery, a wall-sized blackboard is scribbled with chalk where visitors are asked to write their favourite sounds. “My children’s laughter,” writes one person; “Lana Del Rain,” quips another. Soundcheck continues this invitation to personal interaction throughout the exhibition; all lies dormant until some curious individual speaks into the microphone in “Chit Chat,” an installation that translates the slightest vocalization into birdsong, and a muttered “hello” becomes a round of morning chirps. 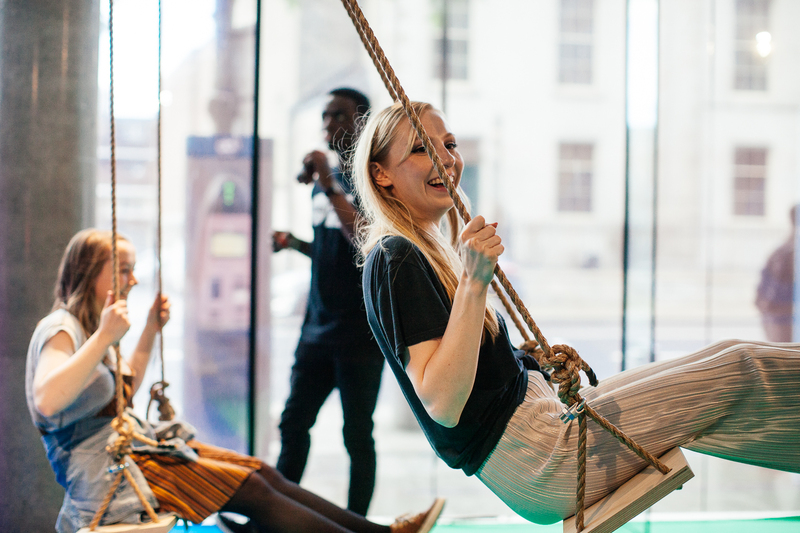 In “Baloica,” a set of swings are fixed to a Kinect motion-sensor which responds to each oscillation with a melodic note, and the higher you swing the more complex the sounds become, turning an everyday activity into an exercise in creative experimentation. Brenda Hutchinson’s “Giant Musical Box” challenges the concept of what sounds “good,” having tuned the brass bars to quarter tones, and allows those with zero musical training to strike a pleasant chord. Upstairs, there is a kitchen stocked with utensils rigged to transform any bang or tap to musical percussion: a ceramic bowl becomes a steel drum, stirring beans in a pan becomes the audible equivalent to neon-lit rain. In “Theremin Tapestry,” historical traditions of weaving are combined with theremin technology to create a piece of art that answers motion with song. Strictly untouchable, this installation demands restraint and a reflection on the relationship between the senses. Although each installation is spitefully unique in its own way, one commonality shared with all is challenging ideas of what music is or can be. “Star Struck” presents a pin-ball machine as a musical instrument, and features a four-person multiplayer play field framed by bass guitars. 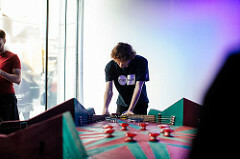 The game features targets that produce stochastic compositions – randomly generated scores created by controlling an array of audio effects – that integrate pinball gaming into compositional construction. Not all installations include teamwork, however. “Ashes to Ashes” is a nightmare soundscape carved from virtual uranium instruments, crowding into the listener’s ears through headphones. Evoking nuclear fallout and stars’ theatrical self-destruction, this installation is a journey from bleak, cavernous echoes to high-pitched swoons tipping into hysteria. This might be what you hear when you put your ear to a black hole, or if you woke to see the moon crashing down through the night. Unity, isolation; sound can do both, whether it’s drawing disparate groups together to make noise in a kitchen or needling in on the individual. What you take from Soundcheck depends entirely on who else is there – cacophony if it’s busy, sparsely-punctuated silence if it’s quiet. Either will make you wonder at these peculiar vibrations we call sound, and at the possibilities that sprout from music’s ongoing love-affair with technology.